Much like any of the indivdual art forms that make up what we know as filmmaking, the world of set design has its own pantheon of great names. It will come as no surprise that the men responsible for shaping the visual audacity of Seijun Suzuki's films are among those considered at the very top. 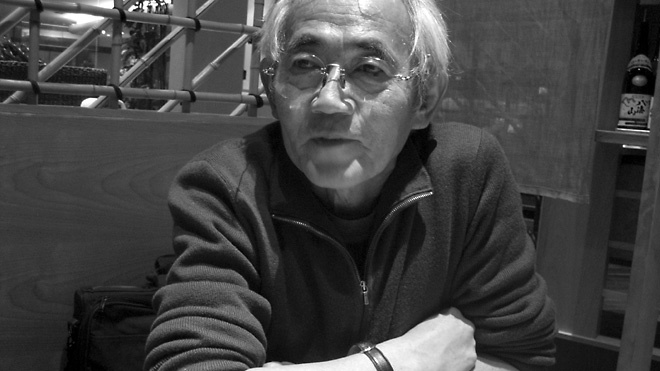 Noriyoshi Ikeya, who worked with unclassifiable master on his Taisho Trilogy, is one of those leaders. Midnight Eye meets an artist whose career spans everything from Ultraman to Rampo Noir. You started your career working for Tsuburaya Productions, is that correct? Actually, I worked as assistant director in the TV department at Nikkatsu before that. There were some really good directors making TV movies back then, so I had the opportunity to work with some very talented people early on, like Kiyohiko Ushihara and Hiromi Higuchi. How did you end up in the television department? The man who ran the directors' department was a friend of mine. He asked me if I was interested in coming to work for him. I was about 23 years old and still a university student back then, but I loved film and when I had to choose between filmmaking and classes, I chose filmmaking. Looking back on it now, that experience as assistant director has been very useful for me. In that job, you have to know a little bit about everything, the technical stuff, the decoration, the actors, all of it. You can become very all-round. There is one type of set designer that asks the director a set of question and then builds the set according to the director's wishes. But that's not my way. Maybe my experiences as an assistant director have made me much more attuned to creating an overall harmony. I'm interested in collaboration and an exchange of ideas with the director. The goal of most assistant directors is to eventually become a director themselves. Did you have that goal too at the time and how did you end up becoming a set designer? I also had the ambition to become a director, even before I became an assistant. Something happened along the way that made me change course. One of the designers who worked for the Nikkatsu TV section went to work for Tsuburaya Productions and he asked me to join him. Work at Tsuburaya was very hectic and he needed someone to help him out, so he asked me. I was studying at Musashino Arts University and this guy said: "If you're studying art, why not become a designer?" Only three months later, my friend left the company. He was doing designs for Tsuburaya's kaiju, coming up with new monsters, but I don't think he was happy doing that. Maybe he felt that it was beneath him or something. I took his place, so only three months after I'd joined the company I was suddenly in charge of design. That's probably the steepest career curve in film history (laughs). Maybe that's why I approach my job differently from most other designers. Could you tell back then already that you did things differently from others? I debuted so quickly, and inevitably that effect was felt down the line. When I moved to the head position, others quickly became assistants. Maybe other department heads are more sensitive to maintaining the hierarchy and they will only let their subordinates climb the ladder one step at a time. I made such a big leap myself, so I didn't mind if others got the same break. Back then, in the late 1960s, the big five movie studios were already facing problems and a lot of people began to criticise or question the way people had been working at those studios. It just happened that around the same time I was an example of a different way of doing things. I never paid much attention to the old style, because I found myself in a very different situation. This was right after Ultraman had started? When I entered the company they were halfway through the first Ultraman series. But it was on Ultra Seven that I began as chief designer. Maybe that was Tsuburaya's peak period in terms of productivity. Was Eiji Tsuburaya still actively involved in the production? I know there was a point where he passed most of the hands-on tasks over to his sons. Yes, he was still active back then. He directed two TV films around the time I entered the company. He wanted to raise the standard of made-for-TV filmmaking. It sounds like he also wanted to do things differently and raise the bar. You must have felt quite at home there, then. Yes, that's true. At the time, most people who were in filmmaking looked down on television and on the people who worked in it. They refused to work in TV and made fun of the quality of TV productions. Tsuburaya's main office was inside the Toho studios. We would work on the Toho lot and have lunch at their canteen. The guard would usually refuse to let us enter the canteen because we were so dirty (laughs). No one from the regular Toho staff worked in special effects, so we were the grimiest looking bunch on the lot. You have had a fruitful collaboration with the director Akio Jissoji, who also started out at Tsuburaya. I assume this is where you first met? Yes, he worked there too, on Ultraman. I was big fan of French film at the time, the Nouvelle Vague, Godard and so on. I imagined myself making those kinds of films, so when my friend asked me to join Tsuburaya Productions, I was a bit hesitant at first. The prospect of making monster movies didn't strike me as being particularly appealing. Then he showed me an episode of Ultraman and I was really impressed. In fact, I thought that with talent like that, we could make better films than the French. And that episode was directed by Akio Jissoji. I know Jissoji studied French and he also did a lot of writing on French film. That's true. Actually, Jissoji knew the way around Paris perfectly, even though he had never been there! It was all in his head, he had the whole city map in there. He would tell me where I should go to find the art book stores. So that created a bond between us. The actress Keiko Kishi had an apartment in Paris at the time and the three of us would often get together and talk about France. What else did you and Jissoji have in common, aside from an interest in French culture? Since I moved up the ranks so quickly, I never had a mentor. Jissoji took that role. I had a lot of respect for him and for his work. We both debuted in film with This Transient Life, which he directed and wrote and I designed. People often point out that Jissoji's films are full of Buddhist motifs, even his Ultraman work. How would you go about interpreting these? I'm not nearly as knowledgeable about Buddhism as Jissoji is, but I learned a lot from him and his points of view. For the 1970 World Expo in Osaka we both worked on a display of a rocket, and Jissoji would for example incorporate the face of a Buddhist deity into the decoration. He figured the rocket represented the future, so he looked for a fitting symbol. He was always working subtle touches like that into his work. Sometimes that was intentional, at other times it happened almost subconsciously. You are still working with Jissoji, including on his most recent films Rampo Noir and Ubume. How has your collaboration evolved over the years? I have the impression that Jissoji maybe became a little milder. Perhaps I'm trying to compensate for this by making my designs a bit more edgy. You've also done a lot of Edogawa Rampo adaptations together. Rampo's stories have a very specific flavour and atmosphere. How did you approach trying to capture that? You could say that as soon as we managed to get the rights to adapt one of his books, we would forget about the book altogether. In other words, we never tried to recreate anything, but come up with our own vision. Interestingly enough, the results always satisfied Rampo's family. Maybe Rampo already left his mark on you since the time you began reading his books in your youth. Inevitably that comes out when you're working on a Rampo adaptation, even when you disregard the original story. The Rampo sense is already inside you, and perhaps it even shaped your visions and your work. That's probably right. It's difficult for me to point out an example, but no doubt he influenced my work, yes. His writing is very visual and he uses a lot of very intriguing images, things that are very obsessive and surreal. A lot of filmmakers who have adapted Rampo are fans of his work and love the ambience of his stories. Maybe that's why a lot of films based on his books have something in common. For example, Rampo Noir consists of four segments that are quite diverse in style, yet they all share a similar atmosphere. It's very difficult to say exactly what that common atmosphere consists of, but they all share it. Kazuyoshi Okuyama's The Mystery of Rampo, on the other hand, completely lacks it, which would suggest that that film wasn't made by someone who cared for Rampo's work. I agree. When Jissoji and I did The Stroller in the Attic, it was just after Okuyama's film. We set out to really do the story justice. Paradoxically, we decided to stay very close to the original in that particular case. Usually, my thought process is to ask myself what Rampo himself would have come up with if he were still alive today. That allows me to create something new that still has a strong connection with the source. When Rampo writes about a blind man, he focuses a lot on smell and touch. The whole imagery of the story is created through smells and touches. That's very difficult to adapt into a film, but that is what makes it all the more challenging to come up with a visual alternative that really expresses that well. You worked on Shuji Terayama's final film Farewell to the Ark (Saraba Hakobune, 1984). Terayama was already very ill when he made it, how did that impact you and the way the film was made? He had a serious problem with his liver and about once a week he needed to have a blood transfusion. He would bring a sofa to the set and lie down from time to time. I went location scouting in Okinawa with Terayama's first assistant, since he couldn't do it himself. We had to find a small village that needed to look like it was in the middle of nowhere. It was incredibly difficult to try and find something that fit the vision that Terayama carried in his head. It was very interesting to try and find things in reality that fit Terayama's notions of them. That film seems to have a lot in common with Jissoji's early films, This Transient Life in particular. Did you feel that there were parallels? I didn't feel there were similarities in terms of their philosophies. What was fun with Terayama was visualising in a very theatrical style. Holes were a big visual motif in the film, with people and things passing through holes, but all those holes were different. I drew about fifteen sketches to try and capture what Terayama was envisioning. That was a really exciting experience for me. Terayama's visual viewpoints were very theatrical, because his background was on the stage. Still, it was me who found that village and made the set designs. I felt that the environment in which this theatrical world was set had to be very realistic. Of course the set was a combination of elements that were made by me and natural elements that were already there. Terayama didn't see the original location, so he didn't know what was original and what was a prop. When he arrived, he went around the set and about everything he found he asked me if I had made it or if it was real. He couldn't tell the difference. That must be the biggest compliment a set designer can receive. Yes, it made me very happy. Funnily enough, that was the complete opposite of how Seijun Suzuki would work. Seijun-san would want to have a red wall as a background, but when I found a red wall, he would say it was too real. He preferred to have a wall that was very obviously painted red, with a very unnatural hue. I did what he asked, but I prefer Terayama's approach. How did you come to work with Seijun Suzuki on Heat Haze Theater and Yumeji? Seijun-san originally wanted his regular set designer from his Nikkatsu days, Takeo Kimura, to work on the film, but Kimura had other obligations. Still, Kimura felt bad about not being able to work with him, so when I was hired, he accompanied me while we went scouting for locations. He kept telling me which kinds of places Seijun-san would like and which he wouldn't. But I threw out all his ideas and did the complete opposite (laughs). I had no interest in being somebody's stand-in, even Kimura's. There were several ideas I suggested that Seijun-san used in the films. The scene in Heat Haze Theater where Michiyo Okusu is in the bath and the fruit appears from her mouth, that was my idea. The director liked it and decided to use it. We only did one take and nailed it straight away. Another great director you worked with is Shinji Somai. His style and attitude seem so different from Jissoji and Terayama, much more naturalistic. Did it come as a surprise to be asked to work with Somai and how did you adapt to his way of working? Suzuki, Terayama, and Jissoji all have a very particular visual style to their work. But Somai puts much more emphasis on the performances and the drama. It wasn't what I was used to, but that difference intrigued me and that's why I agreed to work with him. Somai always begins by talking very intensively with his actors. He wants all the actors to get the psychology and the motivation right. Seijun Suzuki on the other hand, just says: "No reason to think. You just walk over there and turn around. That's all." Jissoji is close to Suzuki's approach as well. Of all the directors I've worked with, Somai is without doubt the director who puts the most emphasis on the drama. Jissoji prefers to shoot an object instead of an actor. For me as a set designer that's more challenging, because then I need to create that object in such a way that it expresses something that would normally be conveyed by an actor. The film I worked on with Somai was Typhoon Club. The final scene is a shot of a school building on the first morning after a tropical storm. After a storm, the sky always clears up, the sun comes out and everything becomes very bright, almost shiny. I had the idea to put gold foil over the windows to make the building look shiny, like in the morning sunshine. The first day we started in the morning, but the rehearsals took up so much time that we didn't actually shoot anything that day. The next day, it was the same situation. In the end, we wound up shooting the scene at the end of the day instead of the morning, and the light we got was of the setting sun. The angle and the light were very different and I wasn't very happy with the result. For Somai, though, the performances were more important and he shot the scene at the moment when he felt the actors were at their best. Everything else was secondary. That shot ended up in the film and even now I am still disappointed with it. I calculated everything, but it all changed (laughs). That was really Somai's way of working. Maybe it would have been better if he hadn't asked me for a shiny building. Experiences like that never made you want to try your hand at directing? Yes, they did. In fact I directed one film about seven years ago called Tokoya, with Ren Osugi in the lead role. I also write screenplays when I have the time and I hope I'll have a chance to direct another film in the future.